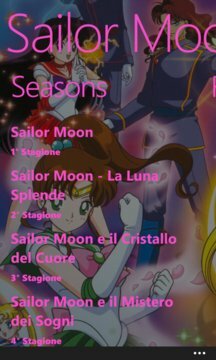 Relive the cartoons of your childhood with this App All episodes from all seasons of Sailor Moon at your smartphone whenever you want and wherever you want! All pictures and videos are found in the web and copyrights are the legitimate owners. To thank us for the work done, vote for us on the store at 5 STARS and a positive review, and if you like the app recommend to your friends! you'll be grateful! If you have problems and / or abnormal contact us and we will solve as soon as possible.